Leading From The Heart » I no longer believe in learning styles. You? I no longer believe in learning styles. You? 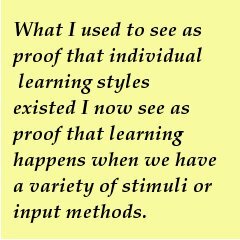 A few years ago I had a series of … conversations … with my then PhD adviser about the notion of learning styles. The conversations included a few of us candidates who were also elementary or high school teachers. He maintained, and would not budge, the stance that there was no evidence to prove the existence of learning styles or the value of learning about individual student learning styles in order to improve their learning in a classroom setting. We maintained that we had seen the value in our classrooms! What was this nonsense about learning style theories being wrong? How could I give up all of the work I had been doing around learning styles in my professional and academic life (a portion of my MA included examining learning style for work in organizational development)? So now it’s a few years later and my coursework for this week falls under the theme of, you guessed it, learning styles. And guess what? My thoughts have changed on the subject. I realize that I have stopped testing for learning styles in my classroom. What I used to see as proof that the individual learning styles existed I now see as proof that learning happens when we have a variety of stimuli or input methods. I focus more on making sure there is a diversity of input – that the material I am presenting (if it is me presenting it) is being presented in a variety of manners. Rather than thinking of each students as having a dominant learning style, I think of how multiple forms of input help to solidify learning in everyone. And then I did some research and found a number of documents on how learning styles can not be measured, that there is no proof of their existence. Of course, we do always find what we are looking for, don’t we? Regardless, the more I think of this, the more it makes sense. Yes, it is possible to supply input (material, lessons, ideas, whatever) in different modalities – visually, kinesthetically, aurally, reflexively, actively, tactiley (according to dictionary.com that is a word, I’m not convinced), [add your -ly here] – and I would argue that this is a good thing BUT that the decision to do so is about good teaching and not about accessing the preferred learning styles of students. Another thought, not so well thought out so give me some room here but if we think that learning is a social activity, why the emphasis on individual learning styles? Like I said, it’s not so well thought out yet so all I really have is the question as a starting point. This was great, thanks–I hadn’t realized there was so much evidence against learning styles. In grad school my professors insisted that we do learning style inventories, etc., and tailor our lessons to them, and my school has recently started encouraging the same. Like you, I’ve focused instead on just changing up my lessons and teaching content in the way that best suits it, and that seems to work well for me. @Magistra X, I hadn’t realized it either until I started to look for it. Most are dated in the past 2 years, though one is from 1999. I’ve questioned Gardner’s work for years–I am glad you put together a succinct list of resources. Sometimes we cripple students with our kindness. I’d also say that your good results are also probably hugely impacted by your dedication to researching methods and materials. One of the things that bothers me most about a lot of people in the profession is that things become kind of hyped and turn into fads or routines – and sometimes they prove to be ineffective. @Michael Doyle I think you are right. When teachers teach to learning styles it is because they are trying to be kind. I may want to watch movies all day but if I want to really learn about a subject I need to do more than watch movies. Allowing me to watch movies instead of having to read about, do, write about a subject may seem to be kind (oh, look how much she likes it!) but in reality I am missing out on other dimensions that I need in order to really grasp something. Being crippled by kindness. @Topher, I’m going to put a link in that other post to refer back to this one so it doesn’t feel like it’s coming out of left field – thanks for pointing that out! There are so many fads and routines in teaching and many are pushed onto us by our administrators. I used to give workshops on how to teach to learning styles because principals wanted their teachers to teach that way. What I find amazing is how quickly and easily so many of us jumped on the learning style bandwagon when there was never any sound research to back it up.